If applicable, your Arena Administrator can add a page to allow designated users to approve Communications that exceed the threshold. Users with approval permissions can view, approve, and reject the emails that exceed the threshold. 1. 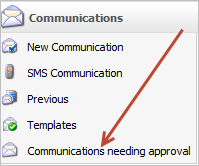 From the Communications menu, click the Communications Needing Approval option. 2. Click the Email link to review. 3. After reviewing the email, you can either approve or reject the email. Arena sends an email notification to the requestor. If rejected, the reason is included in the email. If an email Communication includes members with no email address, you have the option to create labels for these members. Arena tracks Email, SMS and Mail Communications on the Previous Communications page.